Has the contemporary church lost its imagination? 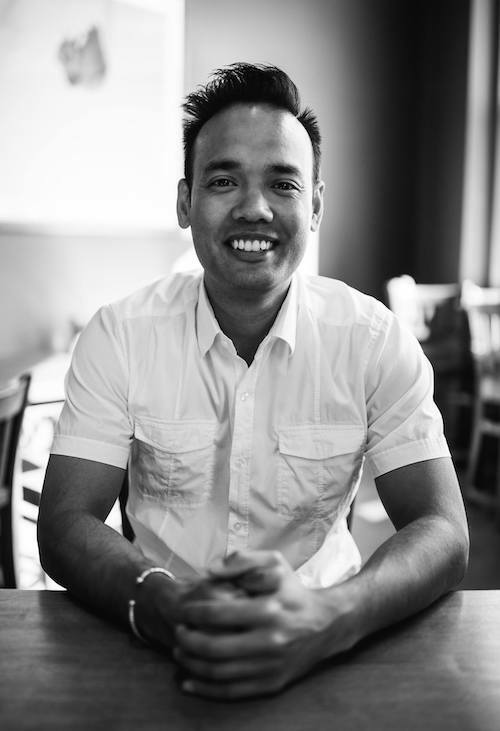 Are we able to dream, let alone do, new things in our churches? Take for instance the typical church service. 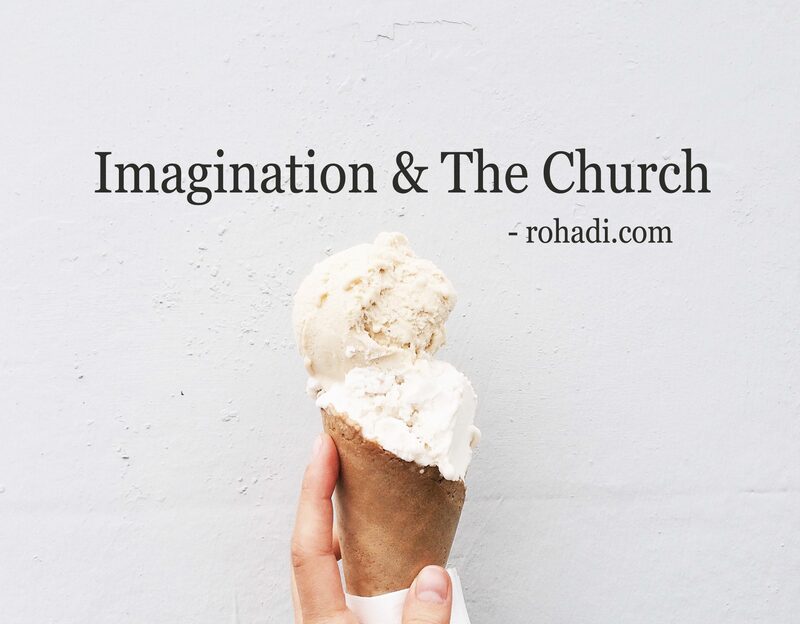 Contemporary worship is like ice cream for dessert (forgive the metaphor). There are different flavours of ice-cream where most white people prefer vanilla, black people chocolate, strawberry people strawberry, and so on. Sometimes things get weird when banana people keep serving vanilla, but usually things stay the same. What ice cream eaters fail to realize is that ice cream isn’t the only dessert to enjoy. There is an endless array of beautiful cakes, cookies, pies, and whatever you can dream of lathered in butter or dipped in sugar. But all churchgoers want, and are alert to, is ice cream in their flavour. We have lost our imagination for new life. One of the outward expressions that demonstrates the level of imagination is the service. Yet the last time I went to a contemporary Sunday service I was so bored I renewed my vow to visit twice a year at most. That’s a big shift coming from someone who used to “do” church events twice, sometimes three times a week. Yes, I know gathering is crucial and being entertained is not (which is why some Christians, despite hating the service, don’t give up their community). But when most resources are poured into the production of the service, you’d think there would be more attempts to literally reinvent the wheel. Rather, be it Protestant, Catholic, liberal or conservative, the point of mainstream gatherings seems to be doing the least to keep already churched people returning in a weekly rhythm. Those who are left have become conditioned to associate the church with the worship (the music and preaching). It’s the location of the worship service that defines “the church”. Why else do refer to outreach ministries not as “church”, but as the “church outside the walls”? Why do we ask, “where do you go to church” in reference to the location. I think if you dug deeper few would associate the physical building as the church. Nonetheless, our language needs a shift. The people are the church. Oddly, how the people gather hasn’t changed much in FIVE HUNDRED YEARS. How can we recapture our imagination? For one, we can try new things. My church is called Cypher Church. It looks and feels unlike anything you’ve likely seen in Christian worship. It’s so different that Christians routinely ask me, “so where do you go to church?” in an attempt to make sense of what they see. Imagine visiting a church service and walking up to the pastor and asking him (usually a him) where he goes to church. That’s what Christians who visit ask me all the time. They want to know what “real” Sunday service I religiously attend. They can’t think because they can’t imagine something beyond their paradigm. That’s part of the reason why I moved on from the typical Sunday experience. Inside I knew there was more to faith and spirituality then the 45 minute sermon and repetitive contemporary rock music. There’s some solace in the sameness of those ancient liturgies, but an underlying problem remains. In its place is the development–or rather the preservation–of listless congregations incapable of discipling others and struggling to join the unfolding mission of God in their midst. Hardly the look of an active priesthood of all believers. That’s not to say the typical church is “bad”. If you like listening to sermons and screaming out your favorite Hillsong song, then your spirit will be filled. I’m just alarmed how similar practically every church looks. For the rest of us, there’s got to be something more than vanilla. We need ways to re-imagine worship and spiritual formation in our primary gatherings. We don’t need fancier ice creams in our churches. Rather, like those baking shows people like (The Great British Bake Off or something? ), we have to try new recipes even if they end in disaster. We need new expressions, and a revitalization of the old, to shape churches towards the celebration of God’s expanding redemptive actions in our neighborhood, city, and world. Part of experimenting is having the environment to do so. 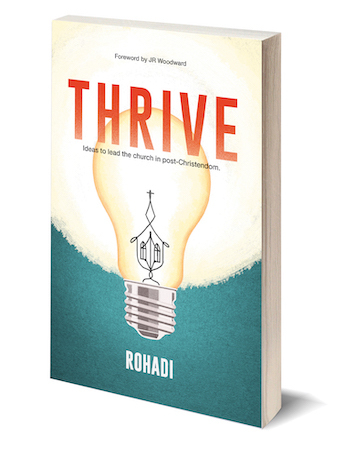 In my book, Thrive, I talk about ways to turn ideas real to join the Kingdom in our midst. Established churches are usually not well suited to try something new on their own. However, they can support new initiatives at arms length. We need more attempts of the old pouring resource into new in the hopes that something sticks and informs the whole what works in our shifting world. How can you practically try something new in your context? As a leader you may be able to “cheat” in a sense. More than likely, someone in your church are already doing interesting things outside of official “ministries” that are worth joining and building into. Find those people and champion their activities. That may be easier than doing fancy retreats with staff to hear the voice of God and what new things may be lurking in the distance. Change needs the support from the top, but it often doesn’t work well when it comes top down. Another way is to affirm the creatives in your community. Although everyone has some level of creativity locked away, some are more in-tuned with their creative side. Once again, bring these people to the table, ask them questions on dreaming up something new for the community, and give them space to try something weird. It doesn’t have to be contentious (which is why many communities prevent innovation), rather incremental shifts may mean all the difference for a church looking for new life. Let’s do something to renew our imagination in the church.